Canada's Anglo-Celtic Connections: Why those mystery DNA matches? Many people have taken an AncestryDNA test to find out about their ethnic ancestry. It's easy to do and understand — and for some the results are surprising. A couple of clicks away AncestryDNA gives a list of DNA cousins from those who also tested with the company. Unless you know a close relative was tested your best matches, like mine, will likely be 4th - 6th cousins. I have several, one at 53 cM with Confidence: Extremely High but no genealogical information and no response to emails. Six are in the same cousin range with Confidence: Very High but only two of those have information further back than parents and most have none. That lack of supporting genealogical information shouldn't be surprising as now many more people have taken an AncestryDNA test than have explored their family history in any depth. Spitting in a tube is easier than doing the research in records even if those records are online. Why are the DNA matches a mystery? Here's a scenario to explore in more detail. Suppose you know all your 1st cousins their descendants and direct line ancestors. 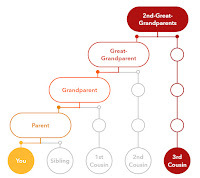 What you haven't done is research down from the 2nd and higher order great-grandparents — all you know in our traditional patrilineal naming system is their surnames which you can search for among your DNA matches. Because the number of people for any relationship down the direct line ancestors varies according to family size I explored three hypothetical scenarios in which all families had either two, three or four children who lived to have the same number of children. Since you don't know the surname of a 2nd cousin unless the descent from the 2nd great grandparent is a direct male line, you can only recognize some of names of DNA matches, the percentage is in the table. Even at the 2nd cousin level, where DNA is fairly reliable in identifying the relationship, you'll only recognize 13 per cent of the surnames. That decreases to 6 per cent for 3rd cousins and 2 per cent for 5th cousins. The lesson should be to manage your expectations. 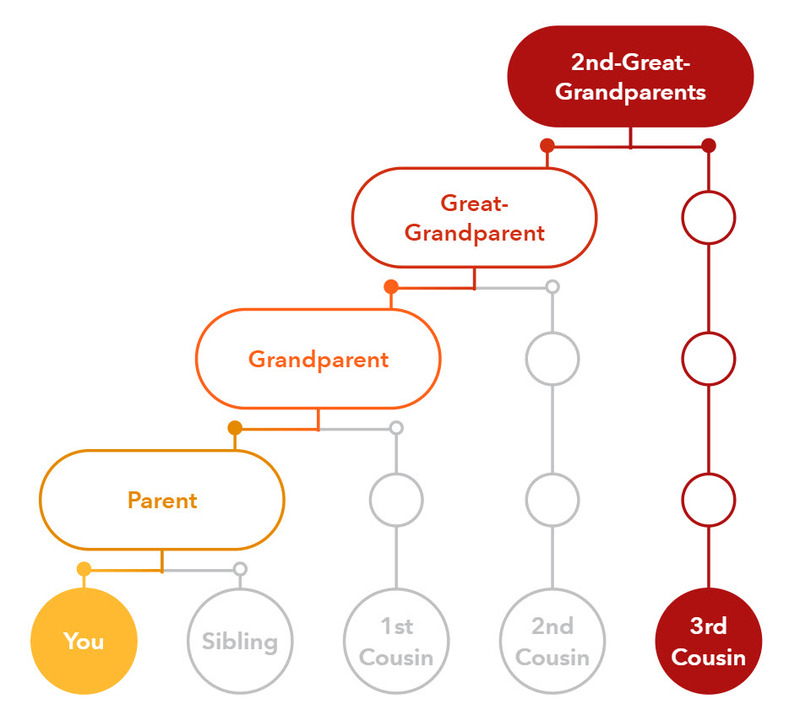 A person in the Two Family enjoys 1024 5th cousins so there's a one in 51 chance a match will have the common ancestor's name. It's many times longer odds for larger family sizes. That may not be something AncestryDNA wants to shout about but the fact is that recognizing matches involves a lot of painstaking research in records. And is it worth it? How much satisfaction do you get from identifying fifth cousins — unless maybe they're rich and famous! Exactly why my tree is as big as it is. I am searching for my brick wall. How did they get to PEI? And why? Another cousin's Y test confirmed it's likely I have the line figured out but I'm missing that piece of paper that lists the children. So all I have is circumstantial evidence. Autosomal matches gives me several additional lines that I can't connect until I find the person who ties us all together. I get huge satisfaction out of identifying distant matches and painting a segment on my chromosomes that came from a specific ancestor. It is the reward of years of research, both back in time and down through collateral lines. I can now say that all my great-grandparents, most of my 2xgreat and some further back are definitely my ancestors. I have been researching the right people!